Remove light imperfections for a beautiful shine! The Chemical Guys V38 Optical Final Polish will help you achieve a great deal of clarity and shine in your paint! V38 is packed with optical grade micro abrasives, which help you remove light imperfections faster than before. Black, blue, red, white, the paint color does not matter. This polish works great on all paint types and brings you a reflective surface safely and easily. Use this polish with a white or black pad, on a dual action (DA) buffer, rotary buffer, or via hand and work in small sections at at time. With only a few passes you will be amazed at how fast those light imperfections are removed and at how optically clear the paint looks. The high end formula is not packed with any oils, silicone or fillers, so you know the results you are seeing are actually there and not covered up or filled in. This fine polish will generally not need to be followed up with a finer polish, but if you have more noticeable imperfections, the Chemical Guys V36 or V34 are great choices that can tackle the job. If you want to remove light imperfections and leave behind an amazing finish, pick up a bottle of the Chemical Guys V38 Optical Final Polish today! The first optical grade final polish designed for perfectionists searching for the deepest level of shine, clarity and depth. V38 is an ultra-refined finishing polish developed to achieve the finest level of optical clarity. Powder and dust free, this product was formulated for extended work time. 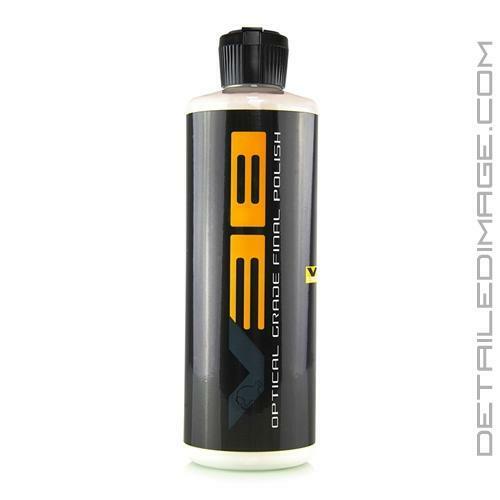 V38 final polish is the first water-based OEM- approved polish capable of removing light paint defects permanently delivering perfect results without filling in or covering up. Optical grade micro abrasives rapidly eliminate imperfections and remove 2500-3000 grit sanding scratches, swirls and holograms. V38 delivers a perfect finish with fewer passes and is equally effective on both ceramic finishes and conventional clear coats. V38 delivers the finest results with unmatched optical clarity. Designed to function without oils, silicones or fillers, V38 maximizes efficiency by optimizing work time to deliver perfect results. It's VOC complaint and body-shop sale for any paint shop environment and was specifically engineered to work with water-based paints and ceramic clear coats. Instructions:Work on cool surface. Shake well. Always work 2' x 2' section at a time. DA Application: Apply 4-5 drops to desired pad. Prime pad with Chemical Guys Pad Conditioner. Spread on speed setting 1. Set DA machine to speed setting 5-6. Using moderate pressure, work area in 2-3 passes until polish becomes clear. Follow with light pressure to finish. Remove residue with clean microfiber cloth. Follow with V38 optical grade final polish for perfect clarity. Rotary Application: Apply 4-5 drops to desired pad. Prime pad with Chemical Guys Pad Conditioner. Set machine to between 1000-1500 RPM's to spread product. Work 2 'x 2' area at a time. Using just the weight of the machine (no pressure) work area in 3-4 passes until polish becomes clear. For final pass adjust speed setting to between 1200-1800 RPM's. Work until optical clarity is achieved. Remove reside with clean microfiber cloth.